A Metro system in operation in the city of Novosibirsk in Russia, this means of public transportation began operations in the year 1986. The fourth service to be launched in Russia and the eleventh in the Soviet Union, the Novosibirsk Metro was deemed to be a huge success as work was undertaken on a war footing to meet the original plans of spreading the system out over sixty-two kilometers on four different lines. However, owing to the financial and economic crisis during the early 1990s, work had to be suspended leaving the entire setup standing as an example of “what-could-have-been.” Currently, it runs on just two lines, serving a total of thirteen stations and is just slightly more than 15 km long. One big drawback of the subway system is that it does not run through any of the so-called “bedroom communities” of the city. Nevertheless, the service is crucial as far as linking the part of town across the river Ob is concerned. Also, it should be noted that the bridge spanning the river is the longest of its kind in the entire country. The highest daily ridership recorded by the metro service was 345,000 in the year 2012. The Novosibirsk Metro can be easily distinguished by means of the large number of commercials adorning its walls. They are an omnipresent aspect of the subway system along with some other features such as TV sets, displays and radios that feature in many of the trains. Map of Novosibirsk Metro showing its lines and stations. 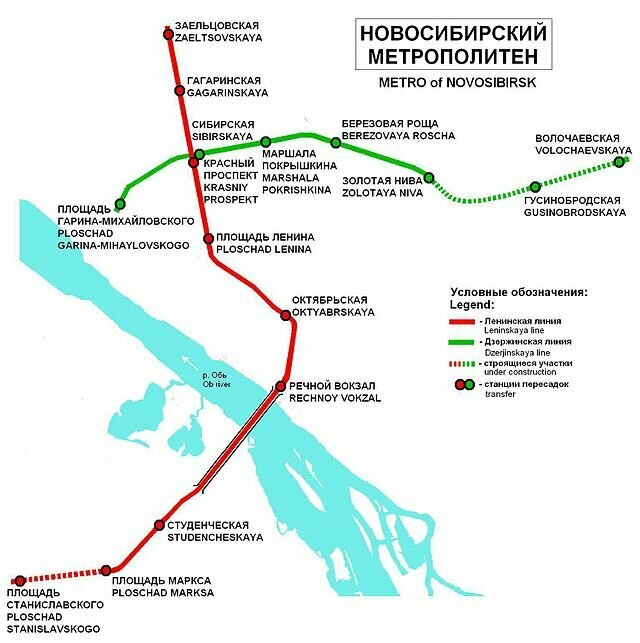 Click on the map to enlarge it or Download Novosibirsk Metro Map in PDF. The metro begins operations at around 06:00 am in the morning and runs till 00:00 am, midnight. The trains have a minimum headway of 3 minutes, which can go up to 12 minutes, depending on the day and time of travel as well. The fare system for the Novosibirsk metro is pretty standardised in nature. A single ticket for an adult, with one hand baggage costs just 20 Roubles. Students get to avail a discounted price but while purchasing the tickets, necessary identity proof/documents is a must. A ticket for a student costs just 10 Roubles. They can also purchase a monthly ticket, which enables unlimited travel on the metro system for an entire month. This ticket costs 850 Roubles. To make use of the metro service in Novosibirsk for free, one needs to be considered an eligible citizen which is determined under legislation. Children under the age of 7 can travel for free. Articles like children’s bicycles, skis, fishing rods etc. can be carried on board the metro provided its dimension comply with the allowed dimensions of general luggage. (150 cm in length and 120 cm in width/height is the maximum) Flammable substances, explosives etc are prohibited. Similarly, animals, trees and transportation vehicles like mopeds, too are not allowed on the metro. Guide dogs are an exception. Look after children and hold on to the railings that the trains are equipped with, for the safety on yourself and other passengers as well. The first line was constructed back in 1986. A promising beginning was cut-short prematurely with the fall of the USSR and Soviet government as severe fund crunch caught up with the construction project. Presently, the Novosibirsk Metro service runs a length of nearly sixteen kilometers along two lines, featuring thirteen stations. The subway service primarily encompasses the central business districts of Novosibirsk.